A-mode scan of a hydatidiform mole as reported by An Shih et al. 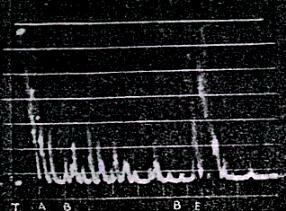 in their paper "The use of pulsed ultrasound in clinical diagnosis" in 1962 in the Chinese Medical Journal. A significant increase number of spikes are seen between the proximal and distal ulterine wall.